Yesterday we shared our Mickey Mouse Clubhouse Party Boards with you, continuing with that theme today I am sharing some tutorials and recipes to help you pull your party off flawlessly. Balance out your salty/savory and sweet. Sweets are so cute it's hard not to go overboard, but be careful because too much can overwhelm you guests. If you are determined to have every sweet concoction you see on the internet consider having a sweets table or candy buffet for guests to take some sweet treats home. Offer more choices. Adults and adventurous kids will love having additional vegetables and dips to choose from. Season with Spice has three great vegetable dip recipes in this post - Honey Mustard, Spicy Whole Grain Mustard and Addicting Dill. Also consider add more vegetable selections like yellow, red and green peppers, cucumbers, radishes, asparagus, squash. 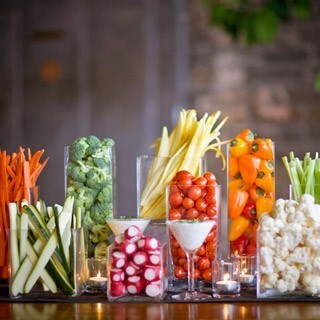 Here's a creative way to display your vegetables. Chicken nuggets don't have to be boring! Off dipping sauces that are sweet, savory, spicy or just plain different. Try Orange Dipping Sauce, Buffalo Sauce, Homemade BBQ Sauce or you always have the option to use ready made sauce from the grocery store or your favorite restaurant. Do keep in mind that mayo and dairy base sauces must be kept cool and will spoil easily. When planning your sweets menu be sure to add variety to your flavors, you don't want chocolate cup cakes, chocolate cakepops & Oreo truffles with devils food cake for the birthday cake. Try Lemon, Strawberry, Orange, Red Velvet or Banana for a nice change. One last thing, when it comes to cakes and cupcakes for a party you can't beat the box mixes for ease of use, price and taste. Party Hats - This tutorial from Project Nursery is a great step-by-step for making party hats. You will need to cut black circles for the Mickey Ears, 2 per hat. Fold the bottom 1/4" of the circle up, hot glue the ear to the hat with the fold facing the back of the hat. Minnie Tutu - Here is a easy tutorial for making a no sew tutu from Skip To My Lou. Add a cute t-shirt and Minnie Mouse ears and you are all set. Mickey Mouse Wreath - A tutorial for making the Mickey wreath from yesterday's post via Tip Junkie. As I said before, you could easily change this to another character by changing the balloon colors and plush. Mickey Silhouette Centerpiece - Remember this gorgeous Mickey centerpiece at the end of my post yesterday? 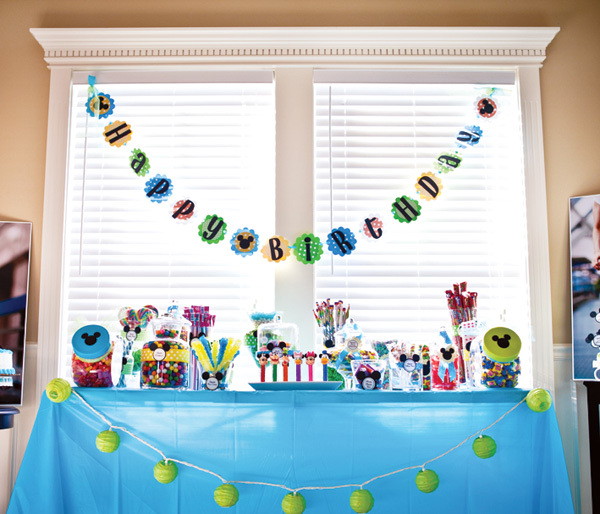 Tip Junkie shared the party from Bits and Pieces of the Better Life who made her version using this tutorial from Shay Bocks. I love the way she displays it on a cake plate. 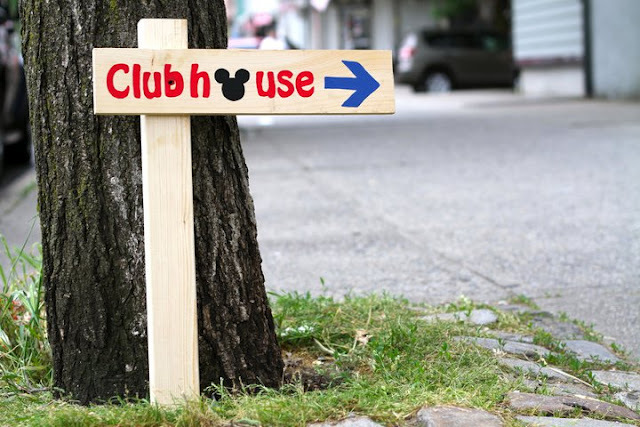 Clubhouse Sign - A cute Clubhouse sign as an alternative to yesterday's Mickey's glove sign, this one is copyrighted to The Petite Soiree. When I started this post I had a lot of things I wanted to include, but now I'm thinking it's information overload. 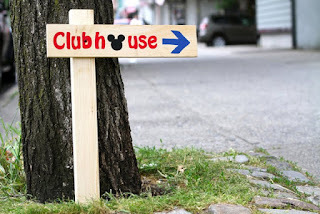 I am going to stop here and post again next week with more tips and tricks to make your Mickey Mouse Clubhouse Party FABULOUS!! I will be including info for setting up a candy buffet!! I apologize for the oversight, I will link it right away. As you can see from the other links in my post I always try to link my readers to the original link. If you prefer I will remove it from the post. Hi Donna, thanks for adding my co. name please ADD the hyperlink to the original source over my name. thank you.